Keeper over the wheel tie down straps are manufactured from a Hi Test Webbing that assures the safest, most abrasion resistant tie down available. 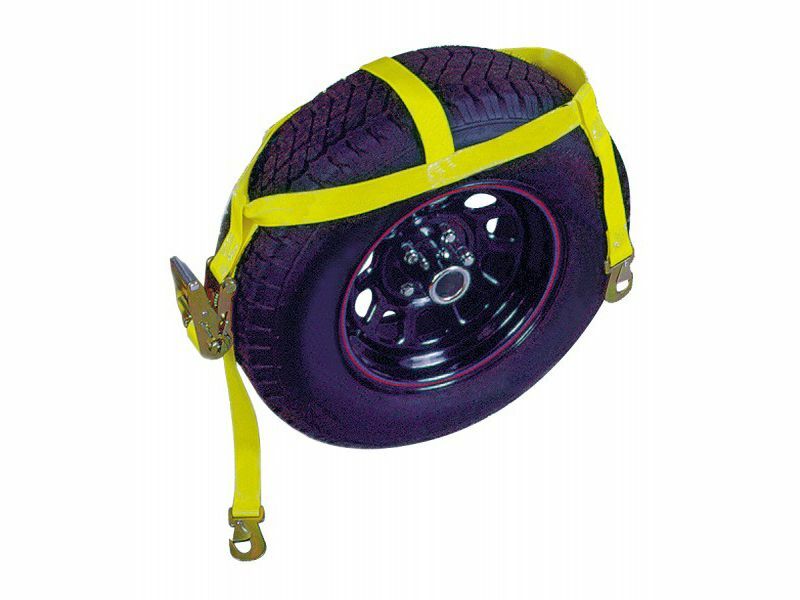 These tie downs are designed to secure a wheeled vehicle for Safe Transport. They are available in Two Different Types; the over the wheel tie down straps 5-1/2' x 2" with Flat Hook and a 6,000 lbs. break strength which is designed for R.V. Dollies and the over the wheel Ratchet Tie Down Straps 5-1/2' x 1-3/4" with Flat Snap Hooks or 5-1/2" x 2" with Twisted Snap Hooks and both have a 6,000 lbs. break strength. The over the wheel ratchet tie down straps are available in 2 Sizes: Fits up to 13" Rims and 6" to 9" Tread and Fits 15" to 20" Rims with 13" to 22" Tread. Keeper over the wheel tie down straps are manufactured from a high test webbing that assures the safest, most abrasion resistant tie down available. These tie downs are designed to secure a wheeled vehicle for safe transport. They are available in two different types; the over the wheel tie down 5-1/2' x 2" w/ Flat Hook and a 6,000 lbs. break strength which is designed for R.V. Dollies and the over the wheel Ratchet tie down 5-1/2' x 1-3/4" with Flat Snap Hooks or 5-1/2" x 2" with Twisted Snap Hooks and both have a 6,000 lbs. break strength. Fits up to 13". The maximum cargo weight a tie-down can safely handle and still accommodate unexpected forces caused by speed, road conditions or emergencies. The industry standard for Working Load Limit is 1/3 the break strength of the tie down assembly.